Hurricane season is an annual reminder of how small we are. Even if we are not in harm’s way, the satellite images of Earth’s atmosphere in motion inspire awe. This year, with its massive storms, I’ve been thinking about the technologies that allow us to see the weather before it happens. The benefits of these technologies are undeniable. In 1900, a powerful hurricane struck the same Texas coast as Harvey, causing the deaths of between 8,000 and 12,000 people. Harvey’s final death toll is likely to be under 100. This remarkable alteration in our relationship to the planet is the result of seeing it from orbit. Governments at all levels prepare emergency and relief services on the basis of satellite data and images. Satellite observations shown on TV convince millions of civilians to take precautions as storms approach, precautions that protect property and save lives. And, of course, extreme weather gives politicians opportunities to promote themselves. They don’t mention the scientists, engineers, and government workers responsible for these wonderful technologies, they’re much more concerned with demonstrating their compassion and leadership. Even though no laws require elected officials to show up at storm-damaged locations, they always do. Cynically, I don’t think they show up as much to comfort the population or to assess the problems as to be in front of the camera. Of course, there are risks. G.W. Bush’s “You’re doing a helluva job, Brownie” comment in New Orleans hurt him when it became apparent that FEMA, the agency Mr. Brown headed, was totally unprepared to deal with the aftermath of Hurricane Katrina. The most famous case of weather hurting a politician was the New York City blizzard of 1969, when the residents of Queens shouted, “Get away, you bum,” when Mayor John Lindsay came to inspect conditions in his limousine. He’d been seen as a Presidential hopeful, but he was never able to escape the stigma of his handling of the storm, in particular that moment when the residents of Queens chased him away. Weather satellites require years of research and development and billions of tax-payer dollars. Most Americans do not know that these observing platforms in space belong to them – not The Weather Channel or Accuweather. NASA and NOAA give away the data and images for free. You can find more pictures, videos, charts and graphs online than on TV, anytime, without having to endure the advertising surrounding the TV shows. Commercial broadcasters reproduce what they get for nothing and sell the airtime to advertisers. Weather information is enormously profitable because all of us are always interested. The weather segments of news shows reliably attract the greatest viewership, even more than the headline segments. The TV personalities who stand in front of the weather maps are typically the highest paid among the members of on-air news teams. It helps if they are as interesting to look at as the maps. When Congress passes a budget, it authorizes expenditures for satellites. 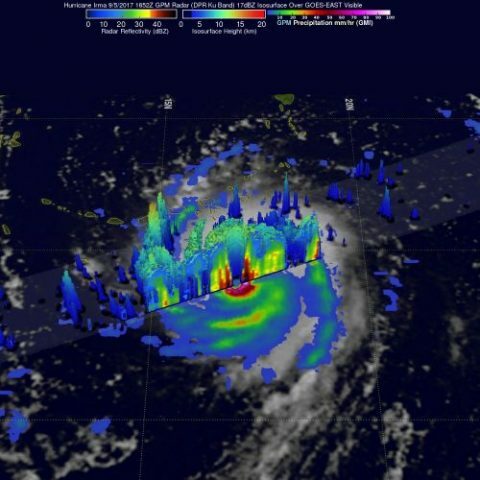 The National Weather Service (NWS) gets its data from the satellites of a sister agency within the National Oceanic and Atmospheric Administration (NOAA). In the 2018 budget, Congress is being asked to allocate $1.2 billion for the continuation of NOAA’s two satellite programs, one polar-orbiting and the other geostationary. These two systems provide all of the data we see on TV or get online, as well as the raw material for research in hundreds of universities, real time forest fire data, volcanic ash data, wildlife tracking, search and rescue missions, soil moisture measurements, and many other civilian uses. By far, the Department of Defense (DOD) outspends NOAA on satellites. But we don’t know by how much because the allocation is deliberately unknowable, hidden within the Department of Defense’s $60 billion “black budget” for military intelligence. DOD’s entire 2018 budget request is $621 billion dollars. Within that larger budget, there are dozens of secret line items that might well hide more satellite costs. We just don’t know. In comparison, NOAA’s $1.2 billion allocation is peanuts. We do know that the Army, Navy, Air Force and Marine Corps each has its own constellation of weather satellites, measuring exactly the same phenomena as the civilian observatories. Why not share? In 1993, a joint DOD/NOAA weather satellite program was initiated by the Clinton Administration as a way to save billions. DOD dropped out of the program in the mid-2000s, unwilling to cooperate with the civilians, ostensibly for national security reasons. NOAA is the oldest scientific agency in the US Government, established by President Jefferson in 1807 to map coastlines. In 1878, weather data collection was added to its mission as The Coast And Geodetic Survey. In 1970, the older agencies were reorganized as NOAA and given the additional mission of observing weather from orbiting satellites. As an indication of the political stakes involved in this kind of science, President Nixon put NOAA inside the Department of Commerce, where it remains. All of that NOAA data, going back to 1807, is archived in Asheville, North Carolina. That’s why we can categorize the 1900 hurricane as a 4 and how we know the extent to which it flooded the region. Far less, by the way, than Hurricane Harvey because there were still wetlands to absorb the deluge. It’s much more challenging for politicians to address climate than weather. It’s not just that the issues have become hotly political. Climate doesn’t offer eye catching photo ops – no streets filled with debris, no suffering people in shelters to attract the cameras. Civilian satellites, NASA’s and NOAA’s, measure “radiation budget”, how much sun energy enters the atmosphere in comparison to the amount radiated back into space. These measurements indicate, without doubt, that the earth is warming in proportion to the amounts of carbonaceous gas we add to the air. And because we have satellite measurements of the atmosphere’s chemical composition, we know that burning carbon fuels is the cause. Some politicians just don’t care.